Have you heard of Wordle? It's a great tool that's been around for a few years now that allows users to create word clouds from websites or blocks of text, with more frequent words appearing larger. There have been numerous blog entries since Wordle's creation showing all the ways it can be useful in the classroom, but today I found a use for it I had not thought of or heard of before. I wanted to write a welcome blog post to my students on my classroom blog, since I gave some of them the link to it at our school's walk-through earlier this week. 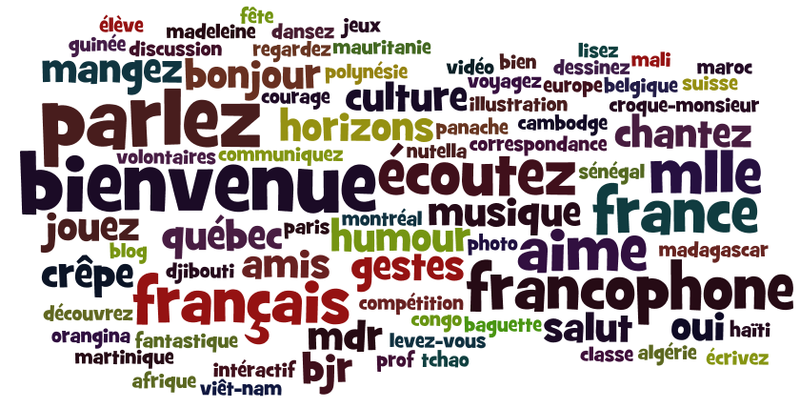 When searching the internet for a suitable picture to use in the post, I decided to make a Wordle. At first I was going to use the text from my blog for the content, but some of the words that I used frequently were random and didn't really give quite the right flavor for what the class will be about. I decided to just type in words manually, typing them two or three times if I wanted them to appear larger. I ended up with something that I think gives a little flavor of the class. 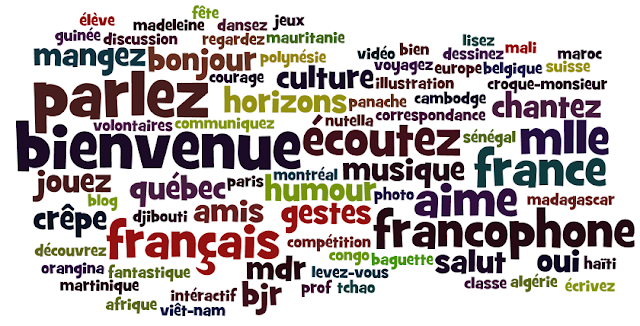 The words I used were French-speaking cities, regions, and countries, frequently used words, foods we eat, and activities we do. When I introduce the blog to all my students next week, I will ask them to identify words they already know. Since many of them are either cognates or expressions posted on one of my bulletin boards with pictures, this shouldn't be too hard a task. Great idea! I like how it turned out. Might do one of my own. Thank you for sharing.